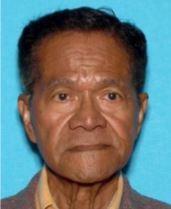 On Thursday, November 29, 2018 at approximately 5:00 p.m., Mr. Senen Merritt, an eighty-two year old Filipino male, was last seen on a northbound SamTrans bus travelling on Mission Street from John Daly Boulevard, in Daly City. Mr. Merritt has not been seen or heard from since his disappearance. Mr. Merritt was last seen wearing a brown plaid sports coat, orange striped shirt, brown slacks, and brown leather dress shoes. Mr. Merritt has a plastic eye shield covering his left eye from a recent medical procedure. He is approximately 5’9” tall, 130 lbs. and has black hair and brown eyes. Due to Mr. Merritt possibly having dementia, he is being listed at risk. He frequents the area of 35 Powell St (Burger King), in San Francisco. Mr. Merritt also commonly uses public transportation systems such as BART, SF MUNI, and SamTrans. If you have any information on Mr. Merritt’s whereabouts, please call the Daly City Police Department at (650) 992-1225. Or TIP at (650) 873-AIMS. Please refer to case # 18008669.